gtkPod: The most popular iPod syncing app under Linux. Seemed too complex initially. Random crashes made it more annoying. Although it works, lacks the feature for voiceover. Floola: Didn’t work at all with my IPod + Crashes! Rhythmbox with IPod Plugin: Rhythmbox wasn’t able to initialize my IPod and I had to do it using gnupod. Other than this, it works fine. It took me a bit of initial effort to get my IPod recognized by Rhythmbox. I had somehow screwed up the partition structure of my IPod. Anyway, if you face the same problem, delete the whole IPod partition and repair it with iTunes. The plugin however lacks the voiceover feature. I stumbled across this modest looking project at https://code.google.com/p/shuffle-db-ng/ and took a liking to it immediately. It is a command line tool written in python and is simple and straightforward. And yes, it supports voiceover too! I studied the whole script after reading about the database format and learned few cool things. I wonder why the voiceover support is still absent from other popular IPod apps. # Unmount and Unplug your IPod and test it out! But with the limited capacity of this little device, adding music this way will be tiring. Thanks to the python script, you can treat your IPod as a normal mass storage MP3 device, sync into it using rhythmbox or any other player, and run the shuffle.py to build the database. Open Rhythmbox or any other player, disable the IPod plugin and make sure the MTP plugin is enabled. Search for new devices and your IPod storage will show up. Add whatever you want to and before ejecting your IPod, run python shuffle.py /path/to/ipod as mentioned in the example. shuffle.py also supports playlists (m3u and pls), but they are a bit of a hassle. The files pointed by the playlist should be inside the ipod storage. If this is true, shuffle.py will automatically scan the playlist file and build the database. Rhythmbox saves the day again! Open the MTP device in Rhythmbox. Select the playlists to sync through Your Device -> properties -> sync, select your playlists, then press the sync button. The .pls files will be created on your IPod and next time you run shuffle.py, Viola! you have your playlists on your IPod! 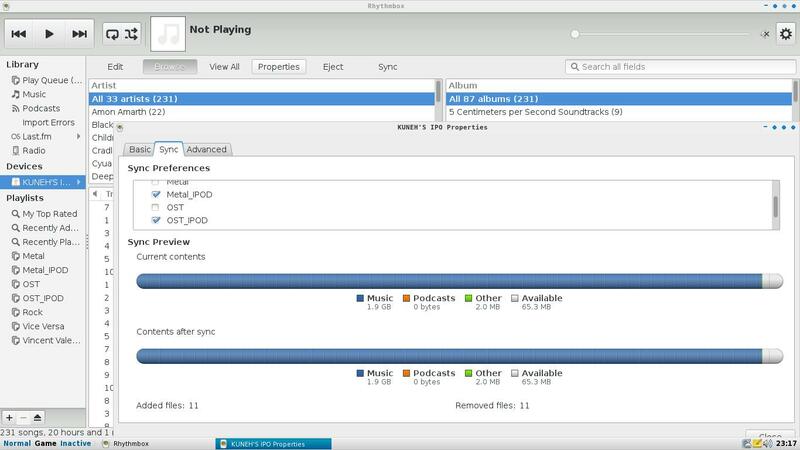 NOTE: In Rhythmbox, the playlist syncing can sometimes produce incorrect .pls files. I observed that this happens when there is some difference in the ID3 tags like artist and album artist in which case the path specified in the .pls file by the MTP plugin sometimes goes wrong, causing the shuffle.py to crash! In such cases, close Rhythmbox, delete the .pls files (not audio files) created on your IPod, start Rhythmbox, sync your device again, the hopefully the new playlists should be right. Inbuilt support for adding playlists from hard drives. Any suggestions, doubts, feedback on this post? Please do comment! Thanks for the script. My shuffle’s name had a space in it and I had to change it for the script to work. No spaces. I install Pico from Synaptic package manager. Using Xubuntu. A good way to reset would be to format it as fat32 (msdos partition table if needed). Add a bunch of mp3 to the drive and run the shuffle script.